Phahameng Township, Free State, South Africa, Feb. 17, 2015 – The ripening tomato crop on the Itshokolele farm promises to be one of the best harvests to date, guaranteeing income to feed the extended family, pay the fees for their children to attend school, and buy enough seeds to plant an even bigger field next season. It was not long ago that the family only scraped by, never able to grow enough to protect their children from hunger. But now, through INMED Partnerships for Children’s South African Adaptive Agriculture Program (AAP), everything has changed. 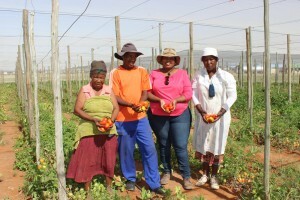 With support from the Monsanto Fund, INMED’s AAP is transforming livelihoods and creating opportunities in poor farming communities in rural Free State, where many small farmers lack the training, resources and access to water that allow them to rise above subsistence levels of production. Through the AAP, INMED is helping the Itshokolele farm, a disabled persons’ cooperative, and at-risk youth in two high schools achieve food security and generate income by producing nutritious, high-value produce on their small plots of land in a way that adapts to the increasingly visible effects of climate change. Improved planting, cultivation and irrigation—including rainwater harvesting and intensive cultivation techniques—is the first step to help farmers maximize production, while training in business planning helps them gain access to new markets, budget effectively, and secure loans and grants to expand their operations. At the Monyakeng Disabled Persons cooperative, INMED has introduced aquaponics—a resource-efficient agricultural technique combining fish farming with hydroponics—as a adaptive strategy for food security and income generation. INMED has implemented aquaponics on a broad scale in Jamaica, Peru and other locations in South Africa, and while the organization did not invent the technology, it has developed a low-cost, scalable design using readily available “off the shelf” materials and simple plans that local builders can easily implement, making this innovative agricultural technique accessible even to low-income families and farming groups.